Decision height is the wheel height above the runway elevation by which a go-around must be initiated unless adequate visual reference has been established and the aircraft position and approach path have been assessed as satisfactory to continue the approach and landing in safety (JAA). . In this definition, runway elevation means the elevation of the highest point in the touchdown zone. The DH recognition must be by means of height measured by radio-altimeter. For CAT II and CAT III A, a pilot may not continue the approach below DH unless a visual reference containing not less than a 3 light segment of the centerline of the approach lights or runway centerline or touchdown zone lights or runway edge lights is obtained. For CAT III B the visual reference must contain at least one centerline light. An Alert Height is a height above the runway, based on the characteristics of the aeroplane and its fail-operational automatic landing system, above which a Category III approach would be discontinued and a missed approach initiated if a failure occurred in one of the redundant parts of the automatic landing system, or in the relevant ground equipment (ICAO). In other AH definitions, it is generally stated that if a failure occurred below the Alert Height, it would be ignored and the approach continued. Decision height is a specified point in space at which a pilot must make an operational decision. The pilot must decide if the visual references adequate to safely continue the approach have been established. If the visual references have not been established, a go-around must be executed. If the visual references have been established, the approach can be continued. However, the pilot may always decide to execute a go-around if sudden degradations in the visual references or a sudden flight path deviation occur. 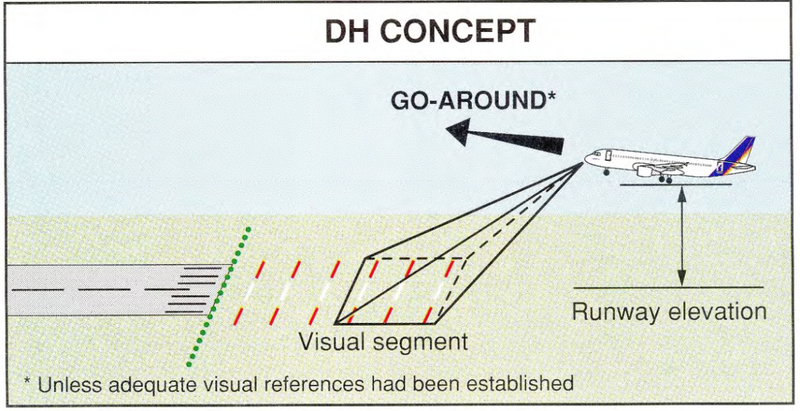 In Category II operations, DH is always limited to 100ft or Obstacle Clearance Height (OCH), whichever is higher. In Category III operations with DH, the DH is lower than 100ft (typically equal to 50ft for a fail-passive automatic landing system and 15-20ft for a fail-operational automatic landing system). Alert height is a height defined for Category III operations with a fail-operational landing system. Above AH, a go-around must be initiated if a failure the fail-operational landing system. The list of these failures is mentioned in the AFM. Below AH, the approach will be continued (except if AUTOLAND warning is triggered). The AH is evaluated during aircraft certification; it is set at 100ft for A300, A310, A319, A320, A321 and 200ft for A330, A340. The AH is only linked to the probability of failure(s) of the automatic landing system. Operators are free to select an AH lower than the AH indicated in the AFM but not a higher value. 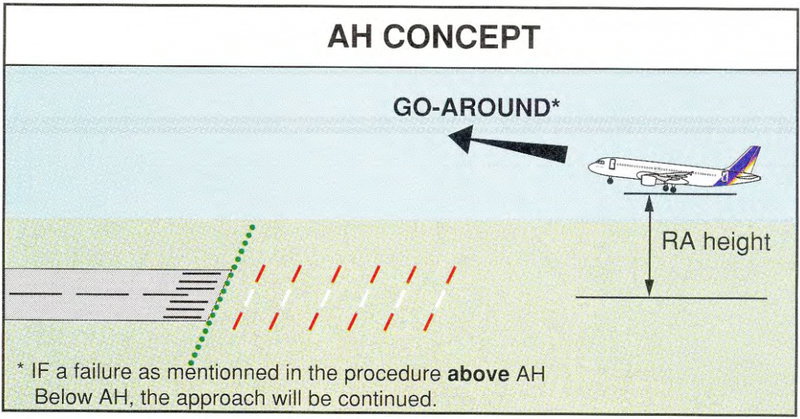 Airbus procedures include both AH and DH concepts for all Fail-operational Category III operations.